2010 release. 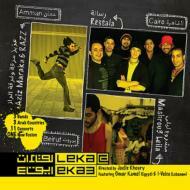 Leka@eka3, the Regional Fusion Tour, was established in 2009. Artists that have built their musical language and audience separately in each country got the chance to meet and fuse their genres to blast a new experience across the Middle East. Jordanian artists included Aziz Maraka & RAZZ, Sign of Thyme, and Jadal. Egyptian artists included Ressala and Omar Kamel, while Mashrou' Leila and I-Voice participated from Lebanon.